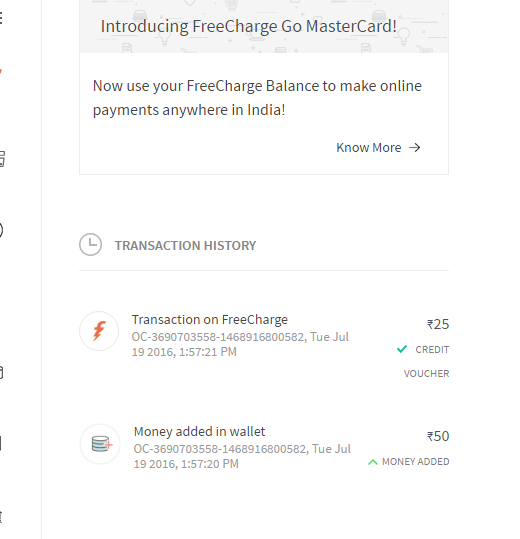 FreeCharge – Freecharge – Get Rs 25 Cashback on adding Rs 50 to wallet. Freecharge India’s largest online recharge & mobile bill payment portal has come again for add money offer for new users and offering Flat Rs 25 Cashback on adding Rs 50 or more to your Freecharge wallet. So Hurry up if haven’t tried freecharge till now !! 5) Enter Min Amount of Rs 50 or more. 6) Not Valid for amount added using FreeFund codes & Netbanking transctions. ← Need Feedback Regarding “Forums” at RechargeTricks !! Cash add krne k bad recharge pr bhi new user wala koi code lggega ja nhi??? use JULY50 or referral code.. Yes.. But only after 7 days of add money. Can you try recharge promo code ? Like – July50 etc ? how have used code “get100” also aligble “get25″+ any new user recharge code like(july50,50new,75fc)..
plz tell me any solution how to send in bank? **this cash balance not cashback i know that. you can transfer to Bank account after 7 days of adding Money. jo acc p add kiya tha, waha se transfer kar k mere old acc pe le liya, abhu kaose transfer hga bank m? Ye dekha raha hsin q?? try with other debit card it will work or try something new..
@Admin bro, is UDIO bank transfer stopped now? When I click transfer to bank it says server down for maintenance. fc go master is not working ..?,, what can i do with that money except recharge..? It will work on Payment gateway..
Like:- Snapdeal, godaddy, payoye etc websites. Also retail stores where Freecharge is accepted. I have lots of freecharge cash back balance,pls give some update tricks to transfer them to bank account. Try after 7 days it will work. I got one old account but when I try other old account then say only first transection. Why?